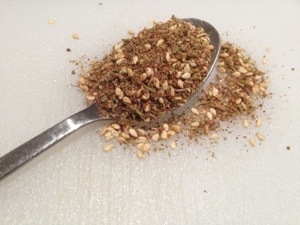 Za’atar is a Middle Eastern spice blend that is full of flavour and super versatile when it comes to it’s uses. I guess it is to middle eastern people what garam masala is to Indians, satay sauce is to Thai people, or master stock to Chinese people…each family has their own version of the recipe. It’s nice because you can change the ratio of ingredients according to taste – there is no right or wrong way of doing it! You can use it as a dip with crusty bread and olive oil, add to oil to make a paste to spread on pizzas or toasted sandwiches, sprinkle on any meat or seafood and grill, fry, bake or BBQ. You can also add it to tagines, casseroles and slow cooker meals, roasts, kebabs and sprinkle it on vegetables or salad…the possibilities are endless! No matter how you use this magical mix, I can guarantee that it makes anything taste amazing! It’s got a delicious aroma, with a slightly lemony taste from the sumac. This recipe made a big batch, but I took some over to my sister for her to try…she loves za’atar so hopefully she likes my version! Quick and easy to make, all ingredients can be found at Woolworths (Coles don’t have sumac), it lasts months in an airtight jar/container stored in a dark place AND it tastes unreal…what’s not to love?! Dry roast the sesame seeds in a pan over a low heat until golden in colour. Add all other spices in a jar/bowl. 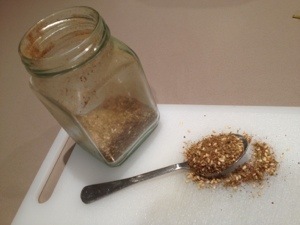 Once the sesame seeds have cooled add to the spices and mix to combine. Store in an airtight container in a cool, dark place for up to 3 months. Thankyou for the recipe, I nearly went and just bought the blend, but now I will definitely be making my own. Thank you for the za’atar. I couldn’t find it anywhere close by me.